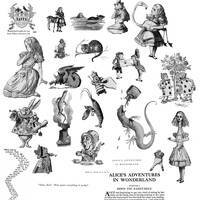 I had fun going back to look at the Tenniel illustrations of Wonderland while pencilling this. I think it's a good mix of the cartoony and the illustrative. Of all the days to upload this, it's the one day I can't wish myself a Very Merry Unbirthday. You have captured the characters veeery well, in my opinion. . Bravo. It's a lovely drawing, with a lot of talent behind it. Thanks! This is one of the few pieces I still think I did all right with. Really? I think it's really awesome. :3. ...how are you posting art that my +watch does not pick up? Bah. I think this was very well suited to your artistic style. You've captured the characters, their personalities, so very well. You made them look like who they are in the book. Also, DORMOUSE CUTE. That is all. Maybe you need to get the Super Ultra Platinum Plus membership, which if I recall right is the only one that does not show ads, ads for ads, and notices to remind you you're not seeing any ads. That's the one I need. I don't remember the fight of the lion and the unicorn...I must go back and reread. Awesome drawing! I love how you got so many of the characters snuck in there! I'm just glad I managed to fit hedgehogs in. So, just out of curiousity, is there any particular reason you chose the March Hare to be the focal point? This was a pic of the animal characters, and the March Hare was the most important and striking that went with the quote. The White Rabbit's so fussy and boring by comparison. Gloves indeed. I love this. This is art. Great work with the shading, love March Hare's expression! It's an old comic book trick for drawing crazed expressions. Heheh, quite a swell piece to share with us today; also, I wish unto you a very Happy Birthday! This is one sharp version of the Wonderland characters! That is the creepiest bunny I have ever seen. Nice! Awesome picture! I love how you drew the unicorn vs lion battle, the mock turtle, and the Cheshire cat most of all. just your luck to post it on your birthday? or maybe you planned it? regardless,its our gift to get to see it !